Does your house need a makeover? Exterior paint can be a cost-effective and relatively easy way to breathe new life into your property. If you’re planning on selling soon, a fresh paint job can increase your home’s curb appeal — and by extension, the number of buyers who will be interested in it. Of course, making the decision to paint the exterior of your home is the easy part. The hard part? Choosing a color! As many homeowners have discovered, a shade that looks beautiful on a sample paint chip can appear different when it’s covering the entire house. Join us as we discuss the tips, tricks, and trends to keep in mind when selecting exterior paint colors! As home improvements go, an exterior paint job is relatively inexpensive, but that doesn’t mean it’s not a sizable undertaking. In other words, you can’t simply repaint it immediately if you aren’t in love with the color, the way you might with painting just one room. Moreover, the color palette you choose will affect not just your family, but your neighbors as well. Technically, your home can be any color you want, public opinion matters not! Right? But deviate too far from your neighborhood’s overall look, and your house will stick out like the proverbial sore thumb. Bear in mind your geographic location, too. A bright turquoise or cheerful coral home looks great in a beachfront community but is generally too glaringly gaudy for a small Mideastern town. Pastel shades like pink and purple might work in a college town, but not so much if you live in an upscale subdivision. 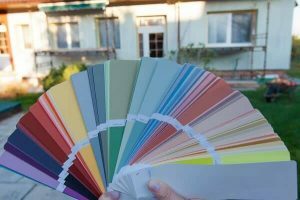 The architectural style of your home, the type of roof, and even the landscaping should all be factored in when selecting exterior paint colors. Now, time to pull out the color wheel and get to work! Once you’ve chosen a contender or two, test them on both the north- and south-facing walls to see how they appear in full sun, partial sun, and shade. White houses and matching picket fences personify the American dream. White is a classic exterior paint choice, and for good reason. It’s neutral, doesn’t call attention to itself, and won’t raise any eyebrows. White paint also goes with just about anything, so you can indulge yourself a little when it comes to door, shutter or even gutter accents. Tradition generally favors warmer shades of white, but try a cooler, blue-tinged hue if you’re feeling a little more modern. Can’t find a gray that you both agree on? Try the trendy home color that bridges the gap between gray and beige. In some ways, beige is the ultimate neutral. You can go with warm or cool tones for the trim, or add a bright pop of color by choosing a rich red or beautiful royal blue for the door. Another popular exterior house color is blue. Ranging from slightly deep to pastel colors, there are several options available. No matter what style of home you have or where you live, there’s a blue hue that will suit you. Steer clear of aqua and turquoise shades — unless you truly want to make a statement. Conservative choices like robin’s egg, sky blue, baby blue, marine blue, or even navy are likely a smarter way to go. You don’t have to live near the sea to choose seafoam — a beguiling combination of green and blue that is quieter and more subdued than darker teals. With white trim for a crisp, clean look, seafoam does a great job of helping your home blend in with surrounding neutral exterior paint colors, but also providing the perfect amount of individuality. Like light blue, a light cream or beige shade is always in style, and there’s a wide range of choices within its parameters. Some creamy colors are just a shade warmer than white; buttery pastel cream gives your home an all-American vibe, especially when paired with white trim and a wraparound front porch. More saturated, red-based yellows bring the warmth of the Mediterranean to your doorstep. Other shades of yellow, like mustard or egg yolk, are great front door accent colors. Used judiciously, dark red shades like brick or cranberry can be stunning as exterior paint colors. Reminiscent of barns and schoolhouses, red is a bolder option than white, cream, gray, beige, or delicate blue. But it’s one that can be absolutely charming on the right home, and with the right trim. Since red is relatively uncommon, your home will always be easy for visitors to spot. Bright, tomatoey reds, or anything that makes you think “fire engine,” are less likely to work well. The darker hues, especially if offset with light trim, are easier for many families to pull off. If you live in a northern area of the country that sees significant snowfall, chances are a dark red home will be absolutely charming in wintertime. Most design experts recommend using no more than three colors total for the exterior of your house — a main color and two others for contrast. One good way to approach this seemingly overwhelming choice is to look at major paint manufacturer’s websites to see their suggested color combinations and palettes. Or contract A Touch of Color Painting and the color consultation is free. Or take a look at our photo gallery, featuring some real-life examples of gorgeous exterior paint colors. Already have your shade picked out? Contact us for a free exterior house painting quote! We’d love to chat with you, answer any questions you might have, and schedule a time for your house’s makeover!